Nov 24, 2015 @ 10:47 AM — by Sharon B. Mateja, D.D.S. There are many different kinds of dental problems that can affect your overall wellness. Whether it's a problem with the teeth, gums, or jaw joint, Dr. Sharon Mateja has a solution for you. A leading dentist in the Rancho Cucamonga area, the practice offers some of the finest cosmetic and restorative dentistry procedures focused on total dental wellness. We've noticed a number of questions about tooth erosion (aka dental erosion and enamel erosion) appear online. Let's take a moment to consider what this condition is and how it can be treated. Tooth erosion refers to damage done to the enamel layer of the teeth as a result of an acidic pH in the mouth. This weakens the enamel and makes it more likely to wear away or break, revealing the dentin layer within the tooth in the process. Left untreated, tooth erosion can result in weaker teeth, discolored teeth (the dentin beneath the enamel gives the teeth a yellow hue), and greater likelihood of broken teeth. Tooth erosion sounds like it's similar to tooth decay, but it's actually a different issue entirely. Tooth decay is caused by oral bacteria sticking to the teeth via plaque and harming the tooth structure as a byproduct of the bacteria eating food particles on the teeth. The patient's oral pH does not play a factor in any of this, though tooth decay does play a factor in the overall damage to your tooth enamel. Even though these are technically different situations, patients should take tooth erosion as seriously as tooth decay given the effects both have on overall wellness. Also keep in mind that dry mouth and poor dental hygiene can also contribute to dental erosion and enamel damage. The ideal treatment for tooth erosion will depend on the extent of the enamel damage. For minor dental erosion, the ideal option for care may be dental bonding, which uses tooth-colored resins painted on the teeth to restore appearance and tooth strength. Slightly more serious dental erosion may be better addressed thanks to the use of a porcelain veneer. Porcelain veneers are thin shells of dental ceramic that are adhered to the front of a tooth, restoring its appearance. 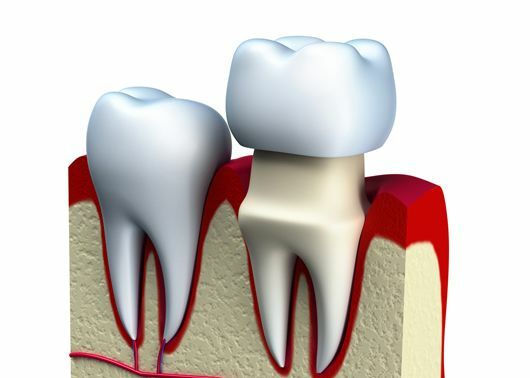 When tooth erosion is very serious, the best option to consider tends to be a dental crown. This will cap a tooth and protect it from sensitivity and further harm. The crown will also restore the strength of a patient's bite, meaning full function without pain. For more information about tooth erosion and how it can be treated and prevented, be sure to contact our advanced dental care center today. Dr. Sharon Mateja and the team at the practice will help you have the healthiest smile possible.